Swift Journal of Social Sciences and Humanities (SJSSH) is an international online, open access and peer reviewed journal that considers scientific papers in all areas of the journal. 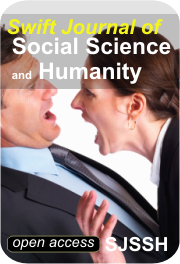 Swift Journal of Social Sciences and Humanities (SJSSH) is an international online, open access and peer reviewed journal that considers scientific papers in all areas of the journal. The journal includes a wide range of fields in its discipline to create a platform for the authors to make their contribution towards the journal and the editorial office promises a peer review process for the submitted manuscripts for the quality of publishing. The Journal welcomes the submission of manuscripts that meets the general criteria of significance and scientific excellence. Papers will be published approximately two (2) weeks after acceptance. All articles published in the journal will be peer-reviewed. The Swift Journal of Social Sciences and Humanities (SJSSH) will be published monthly (one volume per year) by Swift Journals.